Cook your favorites and have an immaculate kitchen free of smoke and odors thanks to this 36" Professional Series island-mount chimney hood with heat sensor. Go ahead and sear your steaks and saute your vegetables with the knowledge that the interior or exterior ventilator (sold separately) will soak up the steam, smoke and odors so you won't have to deal with them later. This unit employs a heat sensor which acts as a safety measure bu automatically kicking the ventilator into max power when temperature levels at the sensor become uncomfortably high. 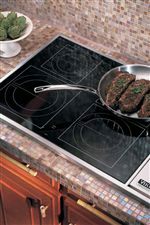 Also implemented on this model are halogen lights, illuminating clearly the cooktop surface and allowing you to create your culinary masterpieces with ease. The model doesn't fail to impress aesthetically, with its beautiful stainless steel exterior and seamless design. 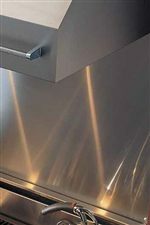 The surface is very easily cleaned as well, saving you time and energy. Enjoy this innovative piece of equipment in your home today! The Professional Series 36" Professional Series Island-Mount Chimney Hood with Heat Sensor by Viking at Colder's Furniture and Appliance in the Milwaukee, West Allis, Oak Creek, Delafield, Grafton, and Waukesha, WI area. Product availability may vary. Contact us for the most current availability on this product. 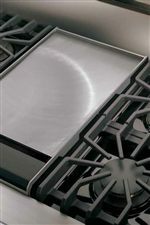 Incorporated in 1984 in Greenwood, Mississippi, Viking Range Corporation was born out of the idea that people deserve professional-grade ranges in their own homes. Over time, this led to the introduction of other premium kitchen appliances such as refrigeration, ventilation, and much more. Fred Carl, Jr., founder and CEO of Viking Range Corporation, created Viking with the vision of bringing the same tools that professional chefs have at their disposal into residential homes. The result of this has produced delicious family meals and sophisticated food storage not only in North America but in 80 countries throughout the world. Viking has everything you're looking for to make a perfect kitchen. The Professional Series allows you to have the best performance available while not sacrificing elegant design and options to put your own touch on your dream kitchen. The most innovative technology is on full display in this line, and that translates into delicious results at the table. Viking is your ultimate kitchen companion, and the only thing you'll be asking for is more time in the kitchen. Don't let the cooking appliances in your kitchen dictate design plans anymore. 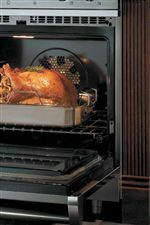 With Professional Series built-in cooking appliances, you can install a gas or electric oven precisely where you want it, fit gas rangetops or gas, electric, or induction cooktops into virtually any cutout, or even install an electric warming drawer in the kitchen island. The options are yours, so let your creativity shine. The flagship Viking product comes in a wide array of sizes, options, and fuel types to accommodate any unique need. 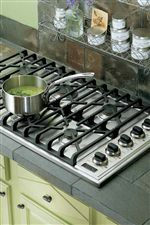 A plethora of surface configurations allow you to pick the one best suited for your cooking style and needs, and even expand your cooking technology to include dual fuel ranges, using a self-cleaning electric oven in tandem with the precise control of gas burners. Between built-in and freestanding refrigerators and freezers, you will never be lacking technologically-advanced storage in your dream kitchen. Refrigerator drawers, beverage centers, ice machines, and even wine coolers are also available, keeping you in charge of what's cold and properly stored. Acknowledging that the kitchen isn't only for cooking and storing food, Viking offers sophisticated dishwashers that will leave the pots, pans, and dishes sparkling clean after you're done using them. Ventilation products make sure that the air is fresh and clear on a daily basis and add to the aesthetic appeal of any room in which they are placed. The Professional Series collection is a great option if you are looking for Appliances in the Milwaukee, West Allis, Oak Creek, Delafield, Grafton, and Waukesha, WI area. Browse other items in the Professional Series collection from Colder's Furniture and Appliance in the Milwaukee, West Allis, Oak Creek, Delafield, Grafton, and Waukesha, WI area.